This outdoor leg press uses your own body weight as resistance. 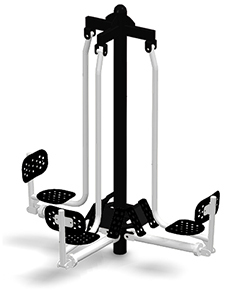 Comfortable perforated seat allows you to focus on working out your leg muscles without putting pressure on the back or spine. Available in one, two, three and four person for more efficient use of space. 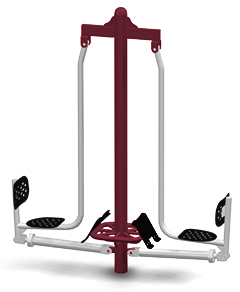 The state of the art finishing process used on the Outdoor Leg Press combines the application of an 'Electrocoat Zinc Rich Primer' with a durable polyester powder-coat top layer to ensure every crevice and joint is completely sealed, providing full protection against	corrosion and weathering. 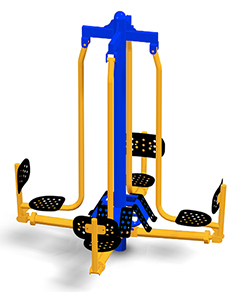 Outdoor Leg Presses are finished in either a gloss or textured polyester powder-coat finish. Low impact on back and spine.